There’s an expression floating around the rationalist corner of the interwebs: “If you’ve never missed a flight, you’re spending too much time in airports”. The idea is that to be sure of making a flight, one needs to get to the airport really early (duh). All those times of being early add up, though, and are potentially more costly. I’m going to take at look at that, but first let’s start with a similar but simpler situation. Consider meeting a friend for dinner. Being a good person you don’t want to be late. just meeting one person, and they’re a friend, so you value their time as much as you value your own. Thus the cost of being early should be the same as the cost of being late, meaning it should be symmetric. Also, small differences matter less than large ones. Your friend won’t even notice if you’re 1 minute late, but they might get a bit annoyed if you’re 15 minutes late. The squared loss has both of these properties. To get really concrete, we need to have some probability distribution over travel times. For this case, I’ll use the Gamma(shape=3, scale=1) distribution, with a minimum of 15 minutes. Assume that we’re walking/biking/driving in low traffic so that there are no discontinuous jumps. Nothing magical here. The loss is minimized when the actual travel time is the mean travel time. The expected loss is close to zero (0.01 on the right axis, whereas the maximum loss is scaled to 1.0). Given the assumed distribution of delay times, there’s about a 40% chance of being late. This is a pretty benign situation and the conclusion is unexpected: Calculate the average time to reach the destination, and leave that much time to get there. FIELDS MEDAL PLEASE! A slightly more complicated situation, which many of us deal with, involves catching a bus. The nice thing about driving is that leaving 5 minutes later means arriving 5 minutes later. However, if you miss your bus, it means waiting for the next one. To model this, we’ll use the same mean-squared loss for being early, but being late (even by 1 second) will add a large additional delay. 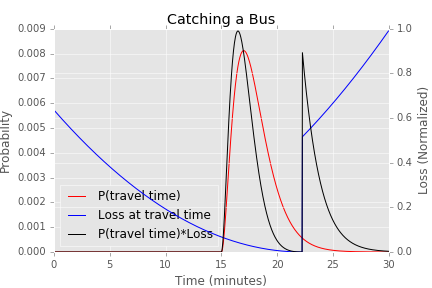 Say the bus runs every 20 minutes, and you miss it by 1 second, instead of the small loss of (1 second)^2 the loss is now (1 second + 20 minutes)^2. For easier comparison I’ll use gamma distribution (with same parameters) of the travel time. So say the bus only comes every 20 minutes. We now leave an extra 4 minutes ahead of time (22 minutes instead of 18 minutes), the expected loss is twice is high, and check out the standard deviation of the loss: 10 times higher (68 vs 5.9)! Notice the probability of being late is only 2.5%, that means we’ve only allowed ourselves to miss the bus 1/40 of the time. For a daily commuter, that would be once every two months. Now lets analyze the case of catching a plane. 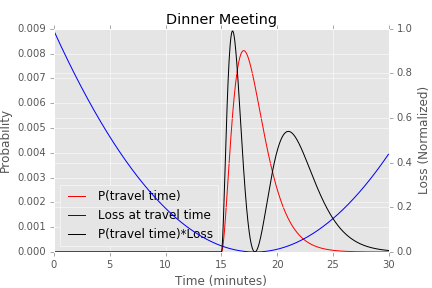 Here I’ll use a normal distribution for travel to the airport, average door-to-gate time 2 hours, standard deviation of 15 minutes. We’ll use the same loss-formula as for the bus, except using an additional wait time of 4 hours. Because of the enormous cost of missing ones flight, we have to leave a lot of extra time. If the average door-gate time is 2 hours, we leave 2.6 hours in advance, and only miss the flight 0.7% of the time. 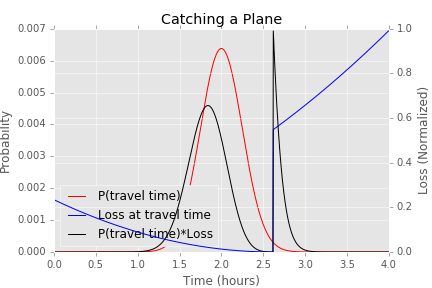 Based on this, if you’re acting rationally (and your loss functions are the ones above), you should miss 1 out of every ~150 flights. So for monthly travel, that would be one flight every ~13 years. So yeah I guess if you’re middle-aged, a really frequent traveller, and have never missed a flight maybe you’re spending too much time in airports, but I wouldn’t sweat it.